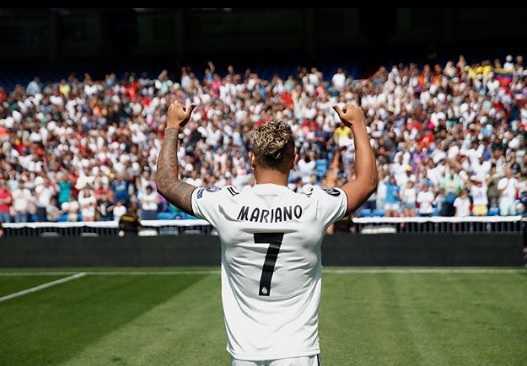 Mariano Diaz Mejia, a professional footballer is known as Mariano in the football world. 25 years old Mariano has recenlty re-signed for Spanish giant Real madrid for an amount of 30 million Euro. 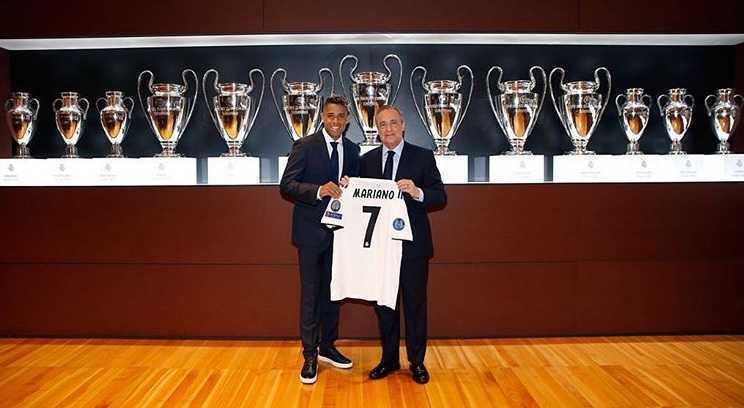 Mariano will be wearing legendary jersey number 7 following the legacy of Cristiano Ronaldo and Raul Gonzalez. Cristiano Ronaldo inherited the Real Madrid jersey number 7 from the legendary player Raul. Now, its upto Mariano whether to continue the legacy set by those legendary Real Madrid players. His brilliant goal scoring profile for Lyon in latest season. He scored total of 18 league goals for Lyon. Born on August 1, 1993 to mother Mariana Mejia and father Mariano Diaz plays as a striker. Mariano was born to Dominican Ethnicity in Premia de Mar, Barcelona, Spain. Mariano started his football career as youtf from local club RCD Espanyol. He joined CF Badalona in 2009 and made his senior debut on 21 August, 2011 against CD Teruel in the Segunda Division B season. He replaced Inkaki Goikoetxea at 79th minute but the team suffered 1-0 loss. Mariano made his first start and played the entire match against RB Linense in Copa Del Rey on August 31, 2011 with a 3-1 loss. He managed to score only a consolation goal for his team. season scoring 25 goals. Former Real Madrid legendary player and former manager Zinedine Zidane called Mariano to Real Madrid's main squad on 20 August, 2016 evaluating his outstanding performance for Real Madrid Castilla. He was given a chance to main team after Karim Benzema's suffered back injury. And a week later, Mariano made his debut for senior team against Celta de Vigo. He replace Alvaro Morata in the 77th minute. Real Madrid won the match by 2-1. Mariano scored his main squad first goal as a equaliser goal against Deportivo La Coruna on December 10, 2016. Mariano was also part of the Real Madrid squad that won the FIFA Club World Cup 2016 in Japan, though he didnot got chance to play any matches for club world cup. Mariano was a backup striker for the main team that won 2016-17 La liga and UEFA Champions League same year. Mariano signed for Olympique Lyonnais from Real Madrid on 30 June 2017 on a transfer fee of 8 million Euro plus 35% interest on the capital gain of a potential future transfer. Mariano's tenure at Lyon was mouthwatering. He made his Ligue 1 debut on August 5 against RC Strasboug Alsace and succeeded in scoring twice in a 4-0 home win. Mariano, Memphis Depay and Nabil Fekir formed a prolific attacking trio for Lyon where Mariano scored a total of 18 League goals, Memphis Depay 19 goals and Nabil Fekir 18 goals. Real Madrid announced that they re-signed Mariano on a five year deal on 29 August 2018 on a trasfer fee of 23 million Euro. This time, Real Madrid gave him the huge responsibility of wearing jersey number 7 and continuing legacy set by legends like Raul Gonzales and Cristiano Ronaldo. His mother being Dominican, Mariano is eligible to play for Dominican Republic and made his international debut on March 24, 2013 in a friendly match against neighbours Haiti. He scored last goal in a 3-1 victory over Haiti. Later, to focus more on his career at Real Madrid and also to avoid being cap-tied with the Dominican Republic, Mariano retired from national team. He was listed for a possible call up for Spanish National Team. Spain national team coach Julen opetegui said that he was evaluating Mariano for a call-up for Spain's national team. Allthough, Real Madrid re-signed Mariano from Lyon with a transfer amount of 30 Million Euro, the salary he will earn Real Madrid and his net worth is yet to be evaluated. However, Real Madrid owned the 35% of the his playing rights and buy back clause, the Champions League Champions had to pay only 23 million Euro. Mariano was also a part of the Real Madrid's main squad when they successfully won La Liga 2016/17, UEFA Champions Leauge 2016/17, UEFA Super Cup 2016 and FIFA Club World CUp 2016 as well. Mariano was a part of the Real Madrid's La Liga 2016/17, UEFA Champions Leauge 2016/17, UEFA Super Cup 2016 and FIFA Club World Cup 2016 winning squad. Mariano was transferred to Lyon from Real Madrid in 2017 and was resigned by Real madrid. Mariano's mother being Dominican, he also played for Dominic Republic National Team and retired early. Spain being the place of birth, Mariano might be called up for duty for Spanish National Team in future.